For someone self-described as “always late to the game,” what draws Gladwell to re-examining past events? "People are willing to be honest with the passage of time,” he tells Larry. And because of this tendency, his interviews have proved shocking and story-changing to events we thought were finished long ago. 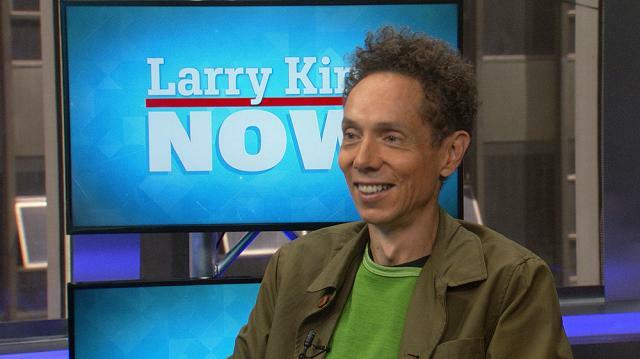 While Gladwell says that yes, maybe his native Canada is boring, he’s not convinced that’s a bad thing. He also reveals the surprising ties between a famous 18th century painter and Hillary Clinton. From here, the two delve into a fascinating discussion on death, justifying discrimination, God, and whether anyone would believe a religion that was started today. "I grew up in the newspaper business, and that world, the internet world, has destroyed the newspaper business. That's the downside. But there's an upside as well, which is that it has made it possible for lots and lots and lots of voices to be heard." – Malcolm Gladwell on the transformation of the news industry with the internet. "Just a generation ago, if you had something to say, you had to go through a whole lot of hurdles to get the world to see it. And, you know, it's just in a space of 15 years that's been completely turned upside down. And that's kind of amazing." "The great freedom of being a journalist is there's... it's the one profession that gives you license to go anywhere. That's why it's the greatest profession in the world. Like what other job is there where it's written into the description: you can do whatever you want!" "I think we're really reluctant to reexamine our conclusions about the past. There's so much to be learned simply by going back and saying, 'We made up our mind about this that happened.' Boom! The day after it happened. And then we just let it sit there and never went back to say, 'Well, was I right?' Think about it. There are all kinds of things you can learn years later that can fundamentally change your understanding of history." – Malcolm Gladwell on the reason his podcast is focused on reexamining past events. "People are willing to be honest with the passage of time." "[Donald Trump] has achieved something I never thought a human being could achieve, which is that he's unfact-checkable. I mean, the man was for gun control like ten years ago. He was a Democrat, for gun control, pro-choice… I mean could go down the list of everything. And then now he's somehow magically morphed into something entirely different. I think he is testing the limits of our, kind of, social generosity in this country." – Malcolm Gladwell on Donald Trump. "All successful people like what they do. It is impossible to be good at something unless you love it. There's just no way to fake it." – Malcolm Gladwell on what successful people have in common. "You gotta break it down, you know? Otherwise I'm not doing my job. I'm a journalist! If you want me to not simplify, then go read the American Journal of Social Psychology, see how far you get." – Malcolm Gladwell in response to criticism that he oversimplifies. "'Be quick but never hurry.' I think about that almost every day." – Malcolm Gladwell on the best advice he's ever gotten.